Today Tuva lost one of the most vivid representatives of the traditional school of Tuvan khoomei, the owner of inimitable performance mastery of kargyraa style, National khoomeizhi of Republic Tyva, Aldyn-ool Sevek. 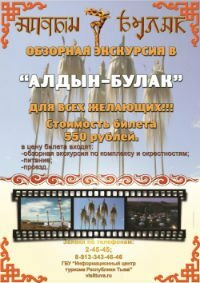 In the words of musicologist Valentina Suzukei, his manner of throat singing was unique to such an extent that it was unmistakably recognizable, just like Soruktu Kyrgys, Ak-ool Kara-Sal, Maxim Dakpai, Kyzyl-ool Sanchy Khunashtar-ool Oorzhak, Gennady Tumat and many of our prominent khoomeizhis. He was the only khoomeizhi whose performance so far nobody in the world could copy or imitate, despite all striving. He spent the last years critically ill in Kyzyl, hospitalized at the oncology hospital, while he very much wanted to go back home - to the distant Mongun-Taiga. But nobody would agree to take the critically ill patient on such a trip. Only thanks to the joined efforts of his musician friends as well as the vice-premier, minister of health, physicians of the oncology hospital and catastrophe medicine, our national khoomeizhi could realize his wish. That is why all those who came to see him off in Kyzyl on his way to his home kozhuun knew that they were seeing him for the last time. Our sincere condolences to Aldyn-ool's family and friends.